Looking for an exciting night out to break up the monotony of the long winter? 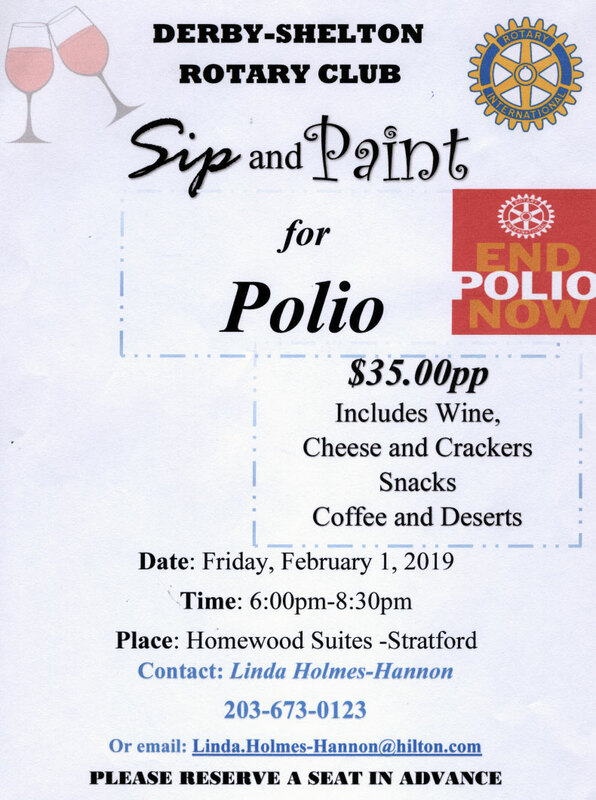 Then Derby-Shelton Rotary Club’s Sip and Paint for Polio night is just for you. On Friday night February 1 just bring along your creative juices and our expert will help you walk away with a masterpiece of your own creation! We supply the canvas, the paints and enough constructive help to speed you on your way. And during the course of the evening, we’ll have plenty of snacks to eat and wine to sip to help create just the right mood! The proceeds from the event will benefit Rotary’s efforts to End Polio Now campaign which is on the verge of eliminating Polio worldwide. This fun evening will be held at Homewood Suites in Stratford from 6:00 – 8:30 pm and we thank Homewood Suites for their generous support in making this possible. Tickets are limited, so call (203 673-0123) or email (Linda.Homes-Hannon@hilton.com) Linda Holmes-Hannon ASAP to reserve your spot.